Doux Reviews: Supergirl: What's So Funny about Truth, Justice and the American Way? Supergirl: What's So Funny about Truth, Justice and the American Way? Kara: I feel like I’m screaming into the void. Manchester Black breaks out of prison with the help of his new team, the Elite. Supergirl tries to apprehend Black and his team while dealing with a shocking new development involving Ben Lockwood. This episode follows a lot of different story threads, and a lot of the choices are not clear cut. Each person has a legitimate point of view. OK, there are some bad people, but they are not totally bad. Or maybe – sometimes they are a little inconsistent? Or maybe they are growing? We open at Catco, and Alex shows up to meet Kara for lunch. But Kara has made other plans with Nia Nal, because she forgot about their lunch appointment. To me this is unrealistic. OK, Kara is not Brainy; there’s no evidence that her mind is such that she would never forget anything. But Kara’s relationship with her adopted sister is the most important relationship in her life, and more important than ever now that it is under the strain that Alex no longer remembers that Kara = Supergirl. On the other hand, I enjoyed the time at the fortress of solitude, where Nia Nal is getting some training. They were enjoyable mostly because of Brainy, who always has great lines and wonderful delivery. The story continues with many characters choosing sides. The Children of Liberty: “Aliens are bad, we should kill them all,” versus the Elite, led by Manchester Black: “Aliens are sick of being killed and are going to kill back.” But our characters – the ones we care about – are stuck in the middle. This leads to ambiguity and difficult choices for our characters, which is interesting. But it also means that the writers are dealing with many different sides, and several different groups of characters, which means that they are juggling a lot and it is hard to follow. Lockwood, released thanks to a presidential pardon, is off to meet the president. Lockwood asks President Baker to deputize the Children of Liberty, but the president says no, and instead just uses him for a photo op to keep up those all-important poll numbers. Baker’s refusal makes sense; the Children of Liberty are a rogue, untrustworthy organization that he cannot trust. The president eventually threads the needle by asking Lockwood to head the alien department. Lockwood also goes back to the Children of Liberty and retakes control in a vicious manner. So often things are resolved by someone beating up someone else. The president has a larger role in this episode than usual. He has ordered the launch of a satellite to shoot down all incoming alien ships, without bothering to check if the ships are carrying aliens with good or bad intentions. This has been done in secret, but the Elite find out and let Supergirl know. Supergirl is not sure what she should do. She goes to Alex as Supergirl and asks her to intervene, but Alex doesn’t even know about it, so her sister-in-secret cannot help her. The Elite, naturally, are also pissed off about the shoot-first-ask-questions-later satellite and reprogram so that its first shot is aimed at 1600 Pennsylvania Avenue in DC. Supergirl (thanks to some assistance from Alex) is able to fly up to the satellite and stop that first shot from taking out President Baker, and then she takes out the satellite. 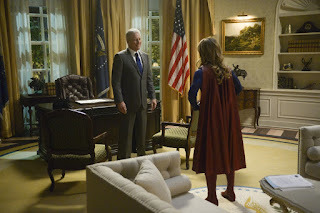 The fact that the satellite was about to take out the White House gives Supergirl the justification to destroy it, making her moral choice easier; the story might have been more interesting without that extra bit. Lena Luthor is currently stationed at the DEO, working at supplying the US government with the product they need to enhance human strength, that is to give humans superpowers. Alex, who has a scientific background, understands what is going on but doesn’t understand why Lena doesn’t just hand over everything to the government. Lena says that she doesn’t trust the government (which means to me that she and James didn’t need to break up, another mild inconsistency). After the satellite incident, Alex also doesn’t trust the government. J’onn J’onnz also has a lot of self-doubts. He wants to follow the way of peace of his father, but he also wants to get out and fight. Another nice exchange was between Brainy and Nia Nal, when they discussed what heroes do – leaping ahead without looking or overthinking. It was nice to watch Brainy’s evolution on the matter, but it also seems very similar to the satellite launched by President Baker: shoot first. The most satisfactory moment of the episode to me was when Alex asked Supergirl to stop by occasionally. The heart of the show has always been the bond between Alex and Kara/Supergirl, and it will add so much to the story to watch this develop. Title musings:”What’s So Funny about Truth, Justice and the American Way?” is the title of the episode. I don’t recall hearing anyone utter anything like that during the episode, but it is a phrase that has been uttered by Superman before (in a Chris Reeves movie). Well, I don’t recall the “what’s so funny” bit, but he did say he was fighting for the rest of it, the ideals that the super cousins support. And yet in this version of the United States, those ideals are being pushed aside. What do you do when you can no longer trust your government? As Manchester Black says, “It’s a bad time to be a good man.” The title works for me. Nice to see one person after another coming in and out of James’s office at CatCo. That is what it is like to be a boss, dealing with one important item after another. Another satisfactory moment was when Colonel Lauren Haley told Alex that she did not know about President Baker’s plan to shoot down all incoming aliens. Hat-guy is cool – he is apparently known as Hat – but we don’t know where he came from. Brainy: You have anticipatory dreams. I have differential calculus. Manchester Black: When they go low, she goes high. We put them six feet lower. President Baker: All you gotta do is look pretty for the cameras. J’onn: One thing’s for certain – Manchester was a test for me. But whether he’s a test of my resolve or just a mirror showing me that I cannot walk my father’s path – I just don’t know. I have mixed feelings about this episode. It’s so clearly a chapter in the season’s arc, that its final value should depend on how it serves that arc – and right now I don’t know how the arc will turn out. For the moment I’m giving it three out of four fifth-dimensional energy hats, but like those hats, the rating could vanish or bring in more hats. Victoria Grossack loves math, Greek mythology, Jane Austen and great storytelling in many forms. Labels: :S4.E13, Supergirl, Supergirl reviews, Victoria Grossack, What’s So Funny About Truth Justice and the American Way? Just FYI, the title of the episode is the title of Action Comics #775(2001), which features a conflict between Superman and The Elite about the same basic issues. It was adapted into an animated movie, I believe it's called "Superman vs The Elite". In it, Superman uses some sneaky tactics to demonstrate to the public the danger if someone with his power level decided to cross the same line. I think the title (both for the comic and the episode) is supposed to be a play on the Elvis Costello song '(What's So Funny 'Bout) Peace, Love And Understanding'. I think my favorite part was the "superfriends" moment when Kara, J'onn, Brainy and Nia faced off with the Elite. And Brainy yelling "Differential calculus!"